Windows Vista allows you to modify how your keyboard works. You might think “a keyboard is just a keyboard,” but it can be more if you know how to configure it. You can control things like the speed of response from the keys, Sticky Keys, and even the sounds you hear. Choose Start→Control Panel→Ease of Access and then click the Change How Your Keyboard Works link. This opens the Keyboard dialog box. Turn on Mouse Keys lets you control your mouse with the numeric keypad. If you turn on this setting, click the Set Up Mouse Keys link to specify settings for this feature. Turn on Sticky Keys lets you press keys in keystroke combinations (such as Ctrl+V to paste) one at a time, rather than in combination. Turn on Toggle Keys is a feature that plays a sound when you press Caps Lock, Num Lock, or Scroll Lock, a useful warning device if you use the number pad a lot or if you’re constantly accidentally pressing the Caps Lock key. Turn on Filter Keys if you sometimes press a key very lightly or press it so hard it activates twice. Use the Set Up Filter Keys link to fine-tune settings of how soon a held-down key will begin to repeat and how much time to allow before a double-pressed key actually produces two characters. 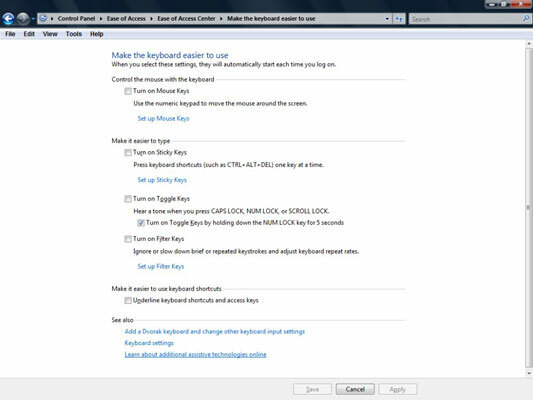 To have Windows Vista underline keyboard shortcuts and access keys wherever these shortcuts appear, select that option. To save the new settings, click Save. Keyboards all have their own unique feel. If your keyboard isn’t responsive and you have a keyboard-challenging condition, you might also try different keyboards to see if one works better for you than another. You can click the Learn about Additional Assistive Technologies Online link to go to the Microsoft Web site and discover add-on and third-party programs that might help you if you have a visual, hearing, or input-related disability. Vista also comes with built-in voice recognition software, which may allow you to rely less on the keyboard.